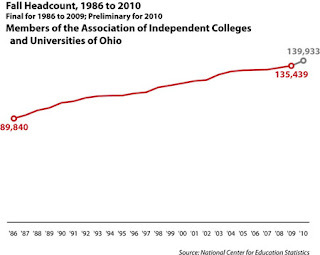 For the 24th consecutive year, Ohio’s independent colleges and universities showed growth in enrollment. This fall’s preliminary headcount estimate of 139,933 is an increase of 4,494 students over the final fall 2009 headcount, or 3.3 percent. It is the largest increase in independent-sector enrollment in seven years.